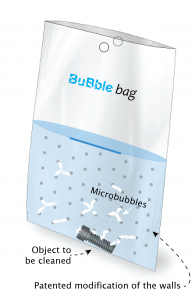 Our BuBble bags are a new, innovative type of container for use in ultrasonic baths. The insides of the bag have been modified with a specific pattern in order to promote cleaning. 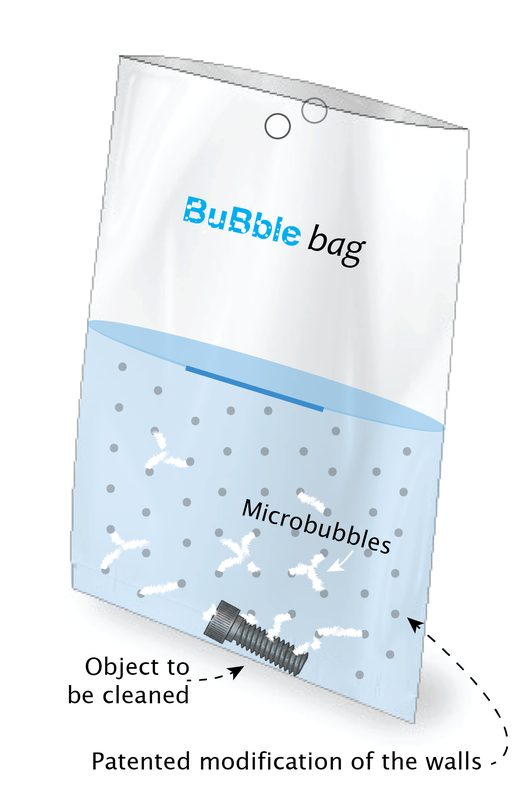 This patented modification generates a lot more microbubbles, which leads to better and faster cleaning of objects inside the BuBble bag. Choose the size that fits best your objects and the depth of your ultrasonic bath. Other sizes are possible on request. Resistant to most commonly used cleaning liquids and doesn’t block the ultrasound (as compared to the commonly used glass beakers, metal baskets and plastic cups). Recycle through the plastic disposal. Filling mark Indicates the optimal filling level. Punch hole For mounting of the bag inside an ultrasonic bath (see also the accessories). Packaging Per 150 (S), 100 (M) or 50 (L) bags in a specially designed dispenser box. Photo of the three available BuBble bags formats. Click on the links below to read detailed examples of how BuBble bags can enhance specific cleaning applications. Multi-user labs for research. Cleaning of microscope glass, tweezer, objectives, lab-on-a-chip, etc., without cross-contamination between users. Also for emulsifying, particle synthesis, graphite exfoliation, radical generation (sonochemistry), salt dissolution, etc. Cleaning of files, mirrors, pliers, etc. No contact damage to diamant burrs; no cross-contamination. Screws, ferrules, 3D printed parts, etc. cleaned of dust and lubricants. Also useful for microfluidic chips. No cross-contamination between wafers in cleanrooms. Cleaning after machining, also for precision technology and miniature parts. >> For more ideas, visit our blog.